This game was released in 2016 with what seemed like a big marketing campaign. For reasons beyond us it seems to have failed somewhat. One reason could be the theme of the game, another the color palete, which for non D&D fans could be off putting. But you should never judge a book or a boardgame by the cover, should you? 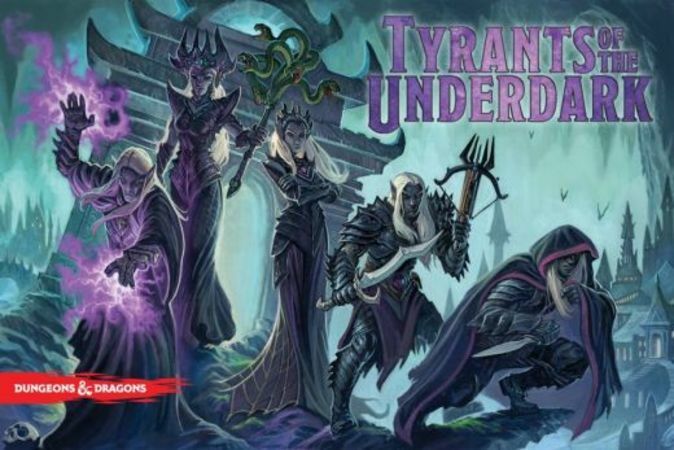 Each player leads a house of Drow, the "darkelves", in a section of the Underdark. The Drow house is represented by a deck of cards, with each card being a minion in that player's deck. Each minion belongs to one of five aspects of Drow society, and those aspects correspond to different strategies in the game, e.g., malice minions excel at assassinating opponents' troops, while ambition minions are best at recruiting additional minions and promoting minions to your "inner circle", which is a special zone that increases their value at the end of the game. The game components, not for everyone.. The set up is fast once you get a hang of it, the only problem can be the troop components, which can be a bit fiddly. You place an ammount neutral troops on the map, depending on the number of players. You shuffle togheter 2 half-decks of cards, to form a central deck of 80 cards. You will turn 5 cards from this deck face up to form a "marketplace", from which you recruit, "buy", cards. You give each player a starter deck with 10 cards, 3 soldiers and 7 nobles each. The soldiers generate Power and the nobles generate Influence. Power is used to placing troops on the map, deploying spies, assasinating enemy troops, and getting rid of enemy spies. Influence is used for buying cards from the marketplace mentioned earlier. On your turn, you play your cards from your hand, add up your Power to use various actions on the map, use your influence to recruit cards from the marketplace. As cards from the marketplace are recruited, they are imidiatly replaced with new ones from the central deck. Ambition, these cards excels att recruiting more minions (cards) and creating a strong inner circle. The inner circle lets you remove a card from your deck and put it in your inner circle, where it might be worth more points in the end. 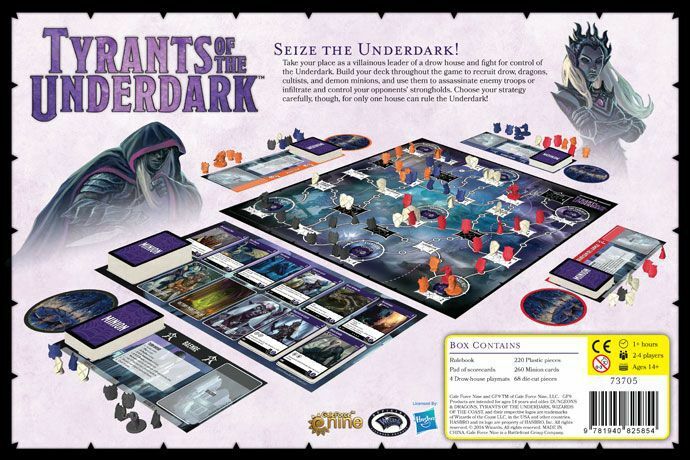 Conquest, as the name suggests, these cards are best for take over the map of the Underdark. Malice, flexible cards which are best at assassinations. Guile, used mainly for spies. Obedience, focus on Power and Influence. Players takes turn fighing over key points on the map, sending spies to establish presence to cities, recruiting various monsters and minions from the market place. This takes about 60-90 minutes depending on the players. This continues until the markplace is depleted or one player has exhausted his private troops. Players score for controlling sites on the map, their recruited minions, the ammount of enemy troops they have assassined, and the ammount of minions promoted to their inner circle, and, not very suprising, the player with the highest score is the winner. Mixes two different type of games (deckbuilding and area control) in a very streamlined way. The area control mechanics are very well put togheter. The "Inner Circle" is a new taking on "trashing" cards. Easy to grasp and teach. Lots of different way to score points. Awsome theme, especially if you like fantasy and/or D&D. Scales very well at 2, 3 or 4 players. The palette, like mentioned earlier, is probably gonna put some people off. But who cares, the game is solid. The components, especially the troops are a bit fiddly. The rest is OK, not great, but OK. Overall a VERY solid game, and a very underrated one at that. One of the best games of 2016, if you ask us, which you should.